As a child, I’d ALWAYS get cookies n cream blizzards whenever my mother took us to Dairy Queen. Going to Dairy Queen was saved only for summer vacation so it was kinda a big deal. It clearly didn’t take much to please us kids lol. As simple as cookies and cream is, (vanilla ice cream and crushed Oreos) there is just something irresistible about anything cookies n cream. And clearly lots of other people share my fascination! It’s been years since I made this cookies n cream cake but I’ve been in such a baking mood lately. Which is really rare because normally I hate being in my kitchen when it’s so pretty outside. My honey bunch has been doing so much work outdoors to get the house in tip top shape for my huge 4th of July party I’m having. He definitely deserved a treat and thankfully he’s easy like me, give us food and we’re happy. 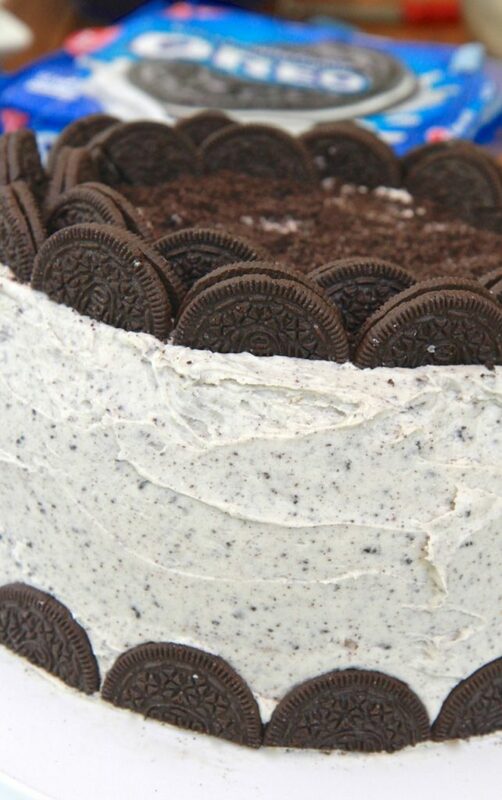 This cookies n cream cake is definitely a treat!!! You don’t want to be caught home alone with this thing. Trust me. Make it, have a slice and give the rest the neighbors or coworkers. You hear me? 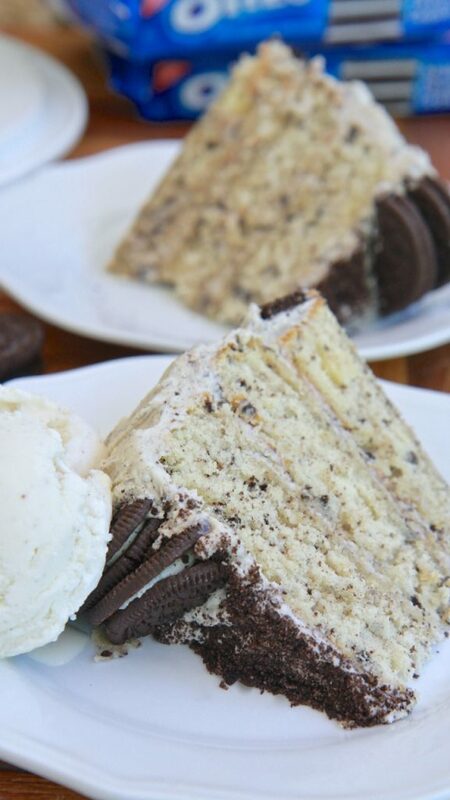 The simple white cake base is perfect for making cookies n cream cake! When I first made this cake I couldn’t decide if I wanted to go with a sour cream cake, cream cheese cake, or white cake. I’m glad I went with a white cake recipe. 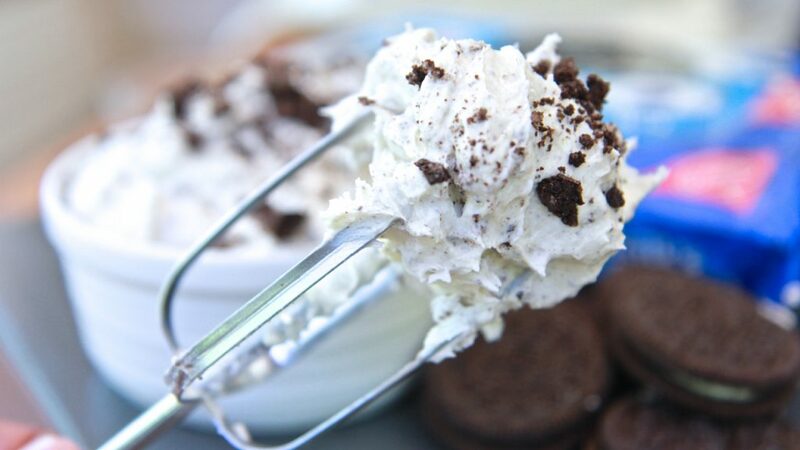 It’s simple, easy, light and went great with this cookies and cream buttercream frosting and vanilla ice cream! 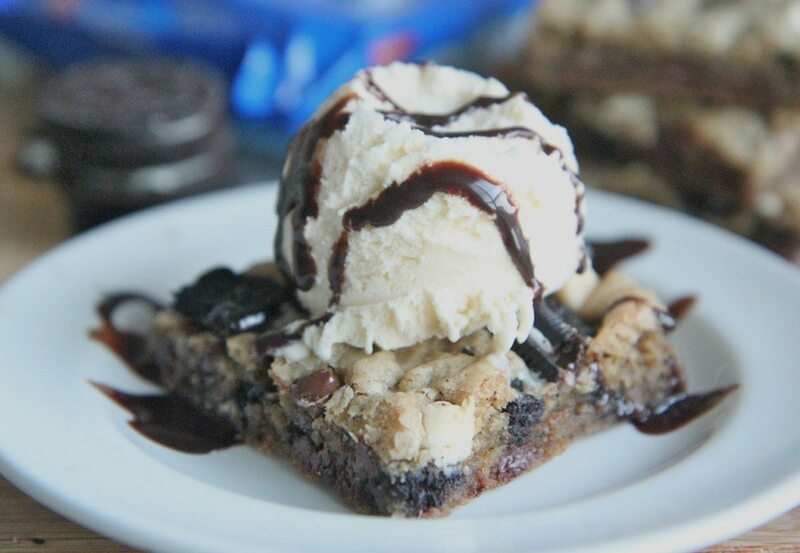 Feel free to up the ante when it comes to the Oreos! I prefer my cake and frosting to be white and lightly speckled with bits of cookie pieces so I didn’t add in too many crushed cookies. I also didn’t want my cake or icing to have a brown tint. Sometimes when you add in too many cookies it will begin to turn the white frosting and cake a light brown. 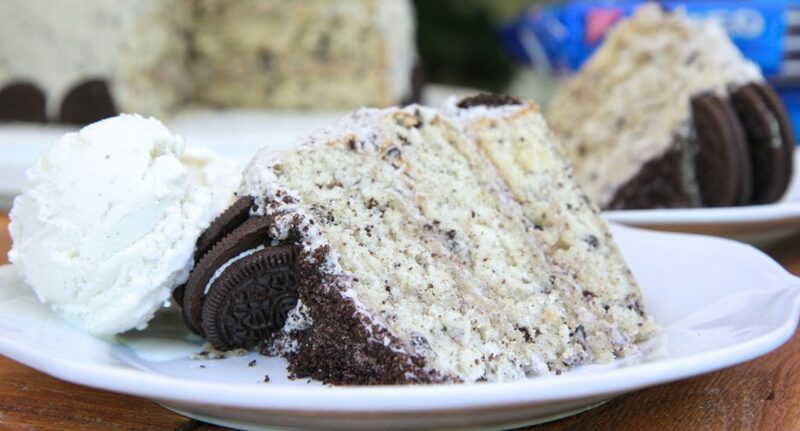 Watch me make this cookies n cream cake from start to finish! Grease and flour 3 (9-inch) cake pans. Set aside. In a large bowl, sift together flour and baking powder. Set aside. In another large bowl cream together butter, oil, and sugar. Mix in buttermilk, heavy cream and vanilla extract. Fold in the eggs whites just until combined. Fold in the crushed Oreos. Evenly distribute batter into the prepared pans and shake pans to even out and release air bubbles. Bake on middle rack for 20-25 minutes. Once pans are cool to the touch, remove from cake from pan and place on cooling rack to finish cooling. Want more cookies and cream? Check out these recipe! I just tried this recipe out last night, and I also had issues with the edges being crisps and crumbly. Used exact measurements so I’m nature where I went wrong but the taste was still nice. Hi I baked this cake and follow each and every step but my cake was so crust from top and edges but was soft in the middle, did I went wrong somewhere? Made this cake and not overly impressed, it was dry and had little flavor. Your cakes are normally spot on so I’m going to try again and see what I perhaps did wrong. 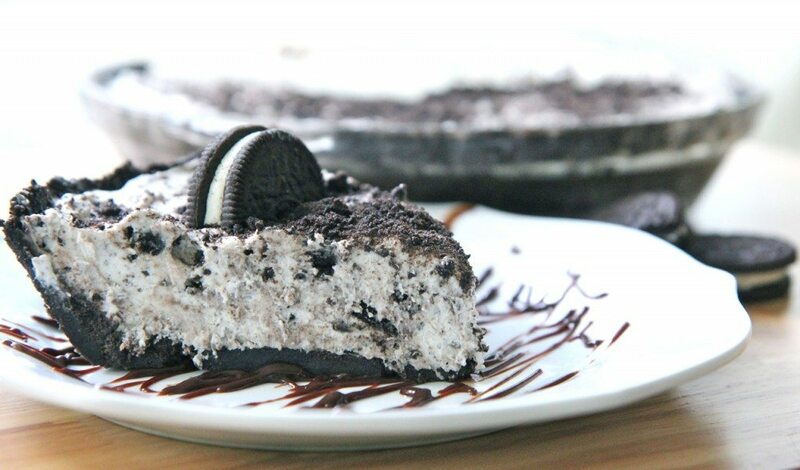 I am making this soon for a friend’s birthday that loves Oreos! I looks delicious! Monique, would you recommend using this recipe as a staple white cake recipe. I’m not a real fan of the Oreo (Ya, I know) and have been looking for a good solid white cake. I’m going to try using cake flour when I make this for my daughter’s next birthday, and see how it turns out.